The goal of mainstream economists is to get everybody to work. As a result, they celebrate capitalism for creating full employment—and worry that capitalism will falter if not enough people are working. The utopian premise and promise of mainstream economic theory are that capitalism generates an efficient allocation of resources, including labor. Thus, underlying all mainstream economic models is a labor market characterized by full employment. Thus, for example, in a typical mainstream macroeconomic model, an equilibrium wage rate in the the labor market (Wf, in the lower left quadrant) is characterized by full employment (the supply of and demand for labor are equal, at Lf), which in turn generates a level of full-employment output (Yf, via the production function, in the lower right quadrant) and a corresponding level of prices (P0, in the upper quadrants). If the money wage is flexible it is possible to ignore the top left quadrant, because, in that case, the equilibrium real wage, employment and output are Wf, Lf and Yf, respectively, whatever the price level. With flexible money wages, the aggregate supply curve is independent of the price level and is represented by YFYF. That’s the neoclassical version of the story. The Keynesian alternative is that the aggregate supply curve is relatively elastic below full employment and the wage rate is fixed by institutions, and therefore is not perfectly flexible. In such a case, aggregate demand determines the level of output, which will normally fall below the full-employment level. And so we have the longstanding argument between the two wings of mainstream economics—between the invisible hand of flexible wages and the visible hand of government spending. But, equally important, what the two theories of macroeconomics have in common is the ultimate goal: full employment. In other words, both groups of economists presume that the aim of capitalism is to generate full employment and that, with the appropriate policies—free markets for the neoclassicals, government intervention for the Keynesians—capitalism is capable of putting everyone to work. But the argument also goes in the opposite direction: capitalism works best when everyone is working. That’s because capitalist growth (e.g., in terms of Gross Domestic Product per capita, the green line in the chart, measured on the left) is predicated on the growth of the labor force (the the red line, measured on the right). Mainstream economists also argue that a low work rate is an important cause of low incomes and high poverty. They argue that, when considering different policy interventions for this population—including improving educational attainment, raising the minimum wage, and increasing the number of two-earner families—the most beneficial intervention for improving incomes is to assume that all household heads work full-time. Finally, mainstream economists argue that, in addition to increasing incomes and decreasing poverty, work has an additional benefit: it gives people dignity and a sense of self-worth. The idea, as articulated for example by Brad DeLong, is that having a job gives workers an honorable place in society, which presumably they are deprived of if they receive some kind of government assistance—whether in the form of payments from one or another anti-poverty program or a universal basic income. “Just giving people money” (according to Eduardo Porter) disrupts the incentive to work and undermines the “social, psychological, and economic anchor” associated with having a job. That’s why there’s such an intense debate these days over the participation rate of U.S. workers. Even though the unemployment rate has fallen to historically low levels (and now stands at 3.8 percent), the lack of participation—whether measured in terms of the labor force participation rate (the blue line in the chart) or the employment-population ratio (the red line)—remains much lower than it was a couple of decades ago. * According to mainstream economists, that’s why rates of growth in output and incomes have slowed. There simply aren’t enough people working. Once again, there’s an ongoing discussion among mainstream economists about the causes of that decline and what to do about it. More conservative mainstream economists tend to focus on the supply side of the labor market and the unwillingness of workers to make themselves available—mostly because they’re benefiting from some part of the social safety net (such as disability insurance, welfare, or government health insurance). Liberal mainstream economists also worry about the supply side (especially, for example, when it comes to women, who might not be able to work because they don’t have adequate childcare) but put more emphasis on the demand side (for example, the elimination of specific kinds of jobs based on international trade, automation, or the effects of economic downturns). Underlying this debate is a shared presumption that more people working will be better for them and for the economy as a whole. Even portions of the Left accept the idea that the goal is to move toward more work. Thus, for example, both modern monetary theorists and Bernie Sanders argue in favor of a government job guarantee. The idea is that, if private employers can’t or won’t make the decisions to hire workers and create full employment, then the government needs to step in, as the “employer of last resort.” Again, the presumption—shared with those in both wings of mainstream economics—is that the goal of the current economic system and appropriate economic policy is get more workers to work more. The utopianism of full employment is so entrenched, as a seemingly uncontested common sense, it’s difficult to imagine a different utopian horizon. But there is one, which emerges from at least three different theoretical and political traditions. In the Marxian tradition, more work also means more surplus labor, which benefits all those who manage to get a cut of the surplus—but not workers themselves, who fall increasingly behind their employers and others in the small group at the top. That’s because, as employment increases, more workers are performing both necessary and surplus labor. Therefore, even assuming the rate of surplus extraction remains constant, the total amount of surplus created by workers increases. But, of course, the rate itself often increases—for example, as a result of competition among capitalists, who find ways of increasing productivity, which tends to lower the amount they have to pay to hire their workers (as I explain in more detail here). So, what appears to be an unalloyed good in the mainstream tradition—more jobs and more workers—is an economic and social disaster from a Marxian perspective. More workers produce more surplus, which is used to create a growing gap between those at the top and everyone else. Capitalist ethics, a pitiful parody on Christian ethics, strikes with its anathema the flesh of the laborer; its ideal is to reduce the producer to the smallest number of needs, to suppress his joys and his passions and to condemn him to play the part of a machine turning out work without respite and without thanks. And LaFargue criticized both economists (who “preach to us the Malthusian theory, the religion of abstinence and the dogma of work”) and workers themselves (who invited the “miseries of compulsory work and the tortures of hunger” and need instead to forge a brazen law forbidding any man to work more than three hours a day, the earth, the old earth, trembling with joy would feel a new universe leaping within her”). Today, in the United States and around the world, the capitalist work ethic still prevails. Workers are exhorted to search for or keep their jobs, even as wage increases fall far short of productivity growth, inequality (already obscene) continues to rise, new forms of automation threaten to displace or destroy a wage range of occupations, unions and other types of worker representation have been undermined, and digital work increasingly permeates workers’ leisure hours. The world of work, already satirized by LaFargue and others in the nineteenth century, clearly no longer works. Not surprisingly, the idea of a world without work has returned. According to Andy Beckett, a new generation of utopian academics and activists are imagining a “post-work” future. I’m willing to keep the utopian label for the post-work thinkers precisely because they criticize the world of work—as neither natural nor particularly old—and extend that critique to the dictatorial powers and assumptions of modern employers, thus opening a path to consider other ways of organizing the world of work. 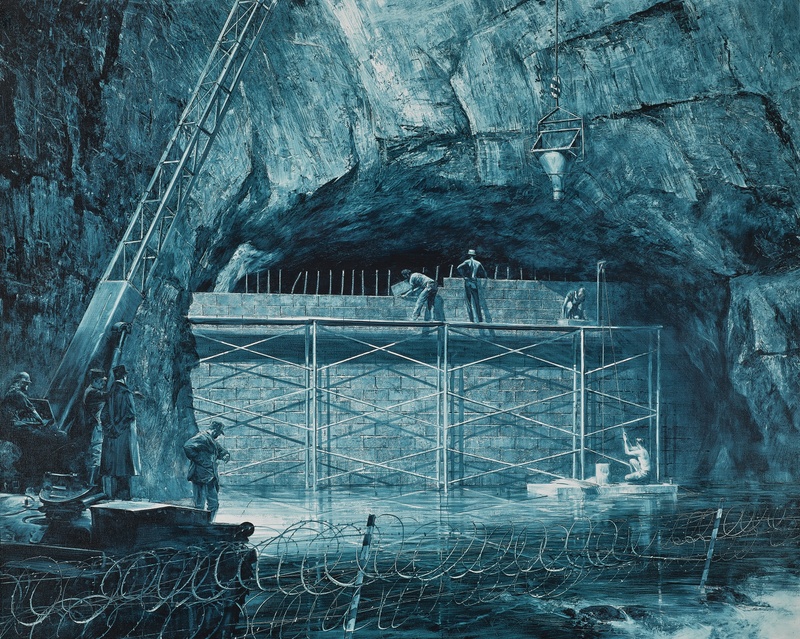 Most importantly, post-work thinking creates the possibility of criticizing the labor involved in exploitation and thus of creating the conditions whereby workers no longer need to succumb to or adhere to the distinction between necessary and surplus labor. convince the proletariat that the ethics inoculated into it is wicked, that the unbridled work to which it has given itself up for the last hundred years is the most terrible scourge that has ever struck humanity, that work will become a mere condiment to the pleasures of idleness, a beneficial exercise to the human organism, a passion useful to the social organism only when wisely regulated and limited to a maximum of three hours a day; this is an arduous task beyond my strength. And there’s a third tradition, one that directly contests the idea that participating in wage-labor is intrinsically dignified. Accordingly we must accept this cruel sounding truth, that slavery is of the essence of Culture; a truth of course, which leaves no doubt as to the absolute value of Existence. This truth is the vulture, that gnaws at the liver of the Promethean promoter of Culture. The misery of toiling men must still increase in order to make the production of the world of art possible to a small number of Olympian men. Nietzsche believed that, in the modern world, the so-called dignity of labor was one of the “transparent lies recognizable to every one of deeper insight.” Apparently, neither wing of mainstream economists (nor, for that matter, many today on the liberal-left) has been able to formulate or sustain such insight. Contesting the utopianism of full employment with a different utopian horizon creates the possibility of imagining and creating a different world—in which work acquires different meanings, in which the distinction between necessary and surplus is redefined and perhaps erased, and for the first time in modern history workers are no longer forced to have the freedom to sell their ability to work to someone else and achieve the right to be lazy. *The Bureau of Labor Statistics calculates the labor force participation rate as the share of the 16-and-over civilian noninstitutional population either working or willing to work. Simply put, it is the portion of the population that is currently employed or looking for work. It differs from both the unemployment rate (the number of unemployed divided by the civilian labor force) and the employment-population ratio (the ratio of total civilian employment to the 16-and-over civilian noninstitutional population). From the very beginning, the area of mainstream economics devoted to Third World development has been imbued with a utopian impulse. The basic idea has been that traditional societies need to be transformed in order to pass through the various stages of growth and, if successful, they will eventually climb the ladder of progress and achieve modern economic and social development. Under what impulses did traditional, agricultural societies begin the process of their modernization? When and how did regular growth become a built-in feature of each society? What forces drove the process of sustained growth along and determined its contours? 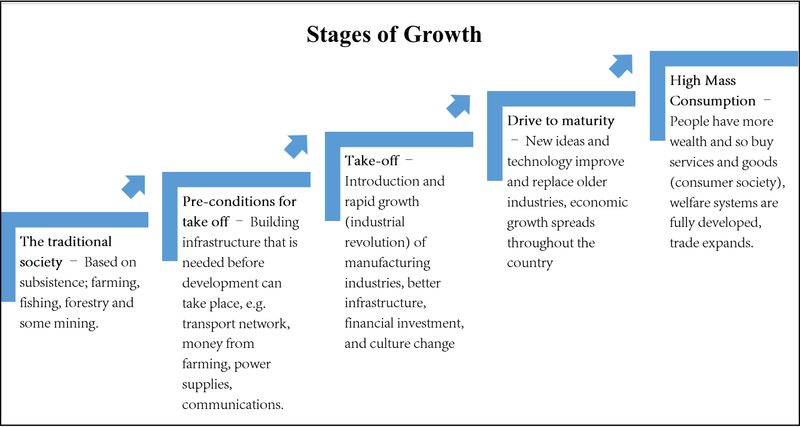 What common social and political features of the growth process may be discerned at each stage? What forces have determined relations between the more developed and less developed areas? Rostow’s model postulated that economic growth occurs in a linear path through five basic stages, of varying length—from traditional society through take-off and finally into a mature stage of high mass consumption. While Rostow’s model and much of mainstream development theory can trace its origins back to Adam Smith—through the emphasis on increasing productivity, the expansion of markets, and the definition of development as the growth in national income—the development models that were prevalent in the immediate postwar period presumed that the pre-conditions growth were not automatic, but would have to be engineered through government intervention and foreign aid. The presumption was that government intervention was required to disrupt the economic and social institutions of so-called traditional society, in order to chart a path through the necessary steps to shift the balance from agriculture to industry, create national markets, build the appropriate physical and social infrastructure, generate a domestic entrepreneurial class, and eventually raise the level of investment and employ modern technologies to increase productivity in both rural and urban areas. That was the time of the Big Push, Unbalanced Growth, and Import-Substitution Industrialization. Only later, during the 1980s, was development economics transformed by the successful pushback from the neoclassical wing of mainstream economics and free-market policymakers. 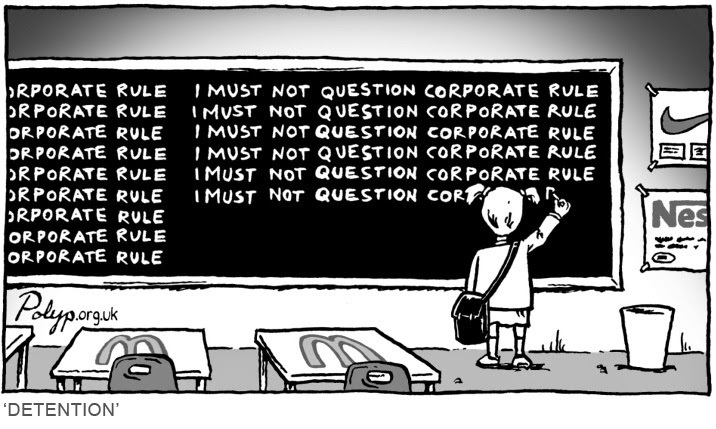 The new orthodoxy, often referred to as the Washington Consensus, focused on privatizing public enterprises, eliminating government regulations, and the freeing-up of trade and capital flows. Throughout the postwar period, mirroring the debates in mainstream microeconomic and macroeconomic theory, mainstream development theory has oscillated back and forth—within and across countries—between more public, government-oriented and more private, free-market forms of mainstream development theory and policy. And, of course, the ever-shifting middle ground. In fact, the latest fads within mainstream development theory combine an interest in government programs with micro-level decision-making. One of them focuses on local experiments—using either the randomized-control-trials approach elaborated by Abhijit Banerjee and Esther Duflo or the Millenium Villages Project pioneered by Jeffrey Sachs, which they use to test and implement strategies so that impoverished people in the Third World can find their own way out of poverty. The other is the discovery of the importance of “good” institutions—for example, by Daron Acemoglu—especially the delineation and defense of private-property rights, so that Rostow’s modern entrepreneurs can, with public guarantees but minimal interference otherwise, be allowed to keep and utilize the proceeds of their private investments. The debates among and between the various views within mainstream development economics have, of course, been intense. But underlying their sharp theoretical and policy-related differences has been a shared utopianism based on the idea that modern economic development is equivalent to and can be achieved as a result of the expansion of markets, the creation of a well-defined system of private property rights, and the growth of national income. In the end, it is the same utopianism that is both the premise and promise of a long line of contributions, from Smith’s Wealth of Nations through Rostow’s stages of growth to the experiments and institutions of today’s mainstream development economists. One part of that critique, pioneered by among others Arturo Escobar (e.g., in his Encountering Development), has taken on the whole edifice of western ideas that supported development, which he and other post-development thinkers and practitioners regard as a contradiction in terms. ** For them, development has amounted to little more than the West’s convenient “discovery” of poverty in the third world for the purposes of reasserting its moral and cultural superiority in supposedly post-colonial times. Their view is that development has been, unavoidably, both an ideological export (something Rostow would willingly have admitted) and a simultaneous act of economic and cultural imperialism (a claim Rostow rejected). With its highly technocratic language and forthright deployment of particular norms and value judgements, it has also been a form of cultural imperialism that poor countries have had little means of declining politely. That has been true even as the development industry claimed to be improving on past practice—as it has moved from anti-poverty and pro-growth to pro-poor and basic human needs approaches. It continued to fall into the serious trap of imposing a linear, western modernizing agenda on others. For post-development thinkers the alternative to mainstream development emerges from creating space for “local agency” to assert itself. In practice, this has meant encouraging local communities and traditions rooted in local identities to address their own problems and criticizing any existing distortions—both economic and political, national as well as international—that limit peoples’ ability to imagine and create diverse paths of development. The second moment of that critique challenges the notion—held by mainstream economists and often shared by post-development thinkers—that capitalism is the centered and centering essence of Third World development. Moreover, such a “capitalocentric” vision of the economy has served to weaken or limit a radical rethinking of and beyond development. *** One way out of this dilemma is to recognize class diversity and the specificity of economic practices that coexist in the Third World and to show how modernization interventions have, themselves, created a variety of noncapitalist (as well as capitalist) class structures, thereby adding to the diversity of the economic landscape rather than reducing it to homogeneity. This is a discursive strategy aimed at rereading the economy outside the hold of capitalocentrism. The second strategy opens up the economy to new possibilities by theorizing a range of different and potential connections among and between diverse class processes. This forms part of a political project that can perhaps articulate with both old and new social movements in order to create new subjectivities and forge new economic and social futures in the Third World. The combination of post-development and class-based anti-capitalocentric thinking refuses the utopianism of Third World development, as it constitutes a different utopian horizon—a critique of the naturalizing and normalizing strategies that are central to mainstream development theory and practice in the world today. It therefore leads in a radically different direction: to make noncapitalist class processes and projects more visible, less “unrealistic,” as one step toward dethroning the “development industry” and invigorating an economic politics beyond development. *At the same time, the Western Powers attempted to reconstruct the global institutions of capitalism, through the triumvirate of the World Bank, the International Monetary Fund, and the General Agreement on Tariffs and Trade (predecessor to the World Trade Organization) that was initially hammered out in 1944 in the Bretton-Woods Agreement. ***Building on a feminist definition of phallocentrism, I along with J.K. Gibson-Graham (in “‘After’ Development: Reimagining Economy and Class,” an essay published in my Development and Globalization: A Marxian Class Analysis) identify capitalocentrism whenever noncapitalism is reduced to and seen merely as the same as, the opposite of, the complement to, or located inside capitalism itself. From the beginning, mainstream macroeconomics has been a battleground between the visible and the invisible hand. Keynesian macroeconomics, represented on the left-hand side of the chart above, has an aggregate supply curve with a long horizontal section at levels of output (Y or real GDP) below full employment (Yfe). What this means is that the aggregate demand determines the actual level of output, which can be and often is at less than full employment (e.g., when AD falls from AD1 to AD2, output to Y1, and prices to P2), with no necessary tendency to return to full employment and price stability. Therefore, according to Keynesian economists, the visible hand of government needs to step in and, through a combination of fiscal and monetary policy, move the economy toward full employment (at Yfe) and stable prices (at P1). Neoclassical macroeconomists, like their classical predecessors, have a very different view of the macroeconomy, which is represented on the right-hand side of the chart. They start with a vertical aggregate supply curve at a level of output corresponding to full employment. Therefore, according to their theory—often referred to as Say’s Law or “supply creates its own demand”—aggregate demand does not determine the level of output; instead, it determines only the price level. 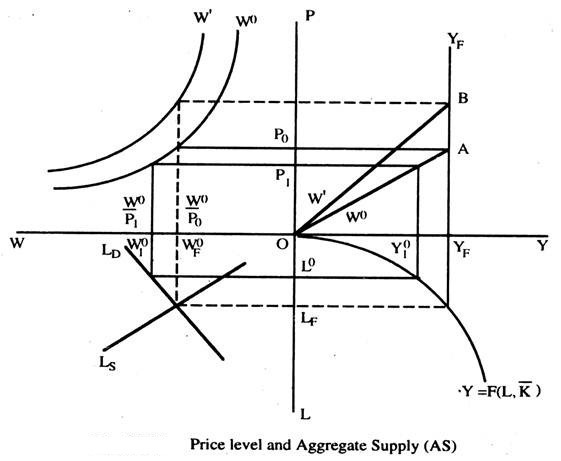 Thus, for example, if aggregate demand falls (e.g., from AD1 to AD2), output does not change (it remains at Yfe)—only the price level falls (from P1 to P2). 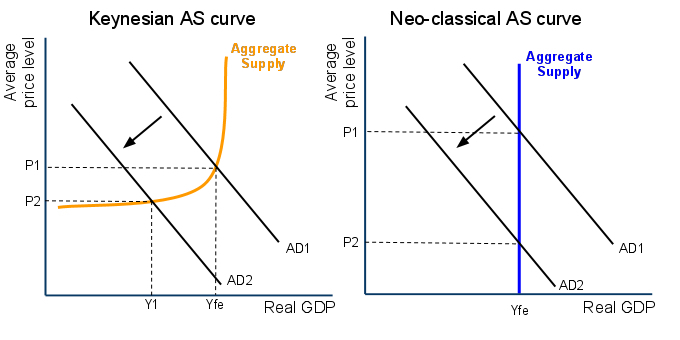 On the neoclassical view, the invisible hand of the market maintains full employment (through the labor market) and reverses price deflation (through the so-called real-balance effect) by boosting aggregate demand (back to AD1 from AD2). But there are equally significant similarities between the two approaches. For example, both Keynesian and neoclassical economists tend to blame economic downturns on exogenous events. There is nothing in either theory that recognizes capitalism’s inherent instability. Instead, mainstream macroeconomists of both stripes direct their attention to equilibrium outcomes—of less-than-full employment in the case of Keynesians, of full employment for neoclassicals—such that only something outside the model can shift the underlying variables and cause the economy to move away from equilibrium. That’s why neither group was able to foresee the crash of 2007-08, let alone the other eighteen recessions and depressions that have haunted capitalism during the past century. Their theories literally don’t include the possibility, endogenously created, of capitalism’s ongoing crises. There’s another, perhaps even more important, similarity I want to draw attention to here: their shared utopianism. The premise and promise of both Keynesian and neoclassical macroeconomics is that, with the appropriate institutions and policies, capitalism can be characterized by and should be celebrated for achieving full employment and price stability. Those are the shared goals of the two theories. And their criteria of success. Thus, each group of macroeconomists is able to claim a position of expertise when the actual performance of the economy achieves, or at least moves closer and closer to, a utopia characterized by levels of output and a price level that corresponds to full employment and price stability. It is precisely in this sense that the economic utopianism of mainstream macroeconomics conditions and is conditioned by an epistemological utopianism. Because they know how the macroeconomy works—because of their theoretical and modeling certainty—both Keynesian and neoclassical macroeconomists claim for themselves the mantle of scientific superiority. These are the lords of macroeconomic policy, domestically and internationally, moving back and forth among their positions as academics, corporate advisers, and policy experts. Hence the persistent claim on both sides that, if only the politicians and policymakers listened to them and adopted the correct economic policies, everything would be fine. Not to mention the ongoing complaints, again on the part of both groups of mainstream macroeconomists, that their advice has been ignored. That, of course, is where the critique of mainstream macroeconomics begins—with a radically different utopian horizon. When the explanations and policies of either side are said to have failed, there’s a shift to the opposing viewpoint. Thus, for example, neoclassical macroeconomics held sway (in the United States and elsewhere) in the run-up to the crash of 2007-08—just as it had in the years preceding the first Great Depression. Leading macroeconomists and their students had moved away from and largely ignored anything that had to do with Keynesian macroeconomics (including, most notably, Hyman Minsky’s writings on financial instability). Then, of course, the tables were turned and at least some mainstream macroeconomists went back and discovered (many for the first time) the theories and policies associated with the Keynesian tradition. failed to see the onset of the current crises; they have had little to offer in terms of understanding how the crises occurred even after the fact; and they certainly haven’t had much in the way of good policy advice to solve the problems of unemployment, poverty, and inequality. . .
On another level, mainstream economists have succeeded. Not only have they maintained their hegemony within the discipline; their models and policy advice have kept the discussion confined to tinkering with the existing set of capitalist institutions. In terms of policy: a bail-out of Wall Street and a mild set of financial reforms, a small stimulus program, and an expansionary monetary policy. And intellectually: a rediscovery of Keynes and an allowance of behavioral approaches to finance. They haven’t proposed even the public works programs and financial reorganization of the New Deal, let alone an honest debate about capitalism itself. In this sense, the continued failure of mainstream economists has become a success for capitalism. In fact, an even stronger argument can be made: the various attempts to move the economy toward full employment and price stability have created the conditions whereby capitalism has both broadened and deepened its presence and made the lives of the vast majority of people even more unstable and insecure. The utopianism of mainstream macroeconomics represents a dystopia for “most families” attempting to survive within contemporary capitalism. What’s left then is a critique of the assumptions and consequences of mainstream macroeconomics—of both neoclassical and Keynesian economic theories. The goal is not just to tinker with the theories (e.g., by bringing finance into the discussion) or the policies (such as technocratic changes to the tax code and raising the level of productivity). Recognizing how narrow the existing discourse has become means we need to question the entire edifice of mainstream macroeconomics, including its utopian promise of full employment and price stability. Only then can we begin to recognize how bad things have gotten under both the successes and failures of mainstream macroeconomics and to imagine and invent a radically different set of economic institutions. That’s the only utopian horizon currently worth pursuing. *Throughout I refer to two groups of Keynesian and neoclassical macroeconomists. But, of course, both theories have changed over time. Today, the two opposing sides of mainstream macroeconomics are constituted by new Keynesian and new classical theories, with increased attention to the “microfoundations” of macroeconomics. The former emphasizes market imperfections (such as price stickiness and imperfect competition), while the latter dismisses the relevance of market imperfections (and emphasizes, instead, flexible prices and rational expectations). And then, of course, there’s the ever-shifting middle ground, which is the basis of a macroeconomics according to which new Keynesian and new classical are both valid, at different points in the business cycle. Like the earlier neoclassical synthesis, the middle ground of “new consensus macroeconomics” is the approach presented to most students of economics. Mainstream economics lies in tatters. Certainly, the crash of 2007-08 and the Second Great Depression called into question mainstream macroeconomics, which has failed to provide a convincing explanation of either the causes or consequences of the most severe crisis of capitalism since the Great Depression of the 1930s. But mainstream microeconomics, too, increasingly appears to be a fantasy—especially when it comes to issues of corporate power. increasing market concentration in leading sectors of the global economy and the growing market and lobbying powers of dominant corporations are creating a new form of global rentier capitalism to the detriment of balanced and inclusive growth for the many. The analysis suggests both that surplus profits for all firms have grown over time and that there is an ongoing process of bipolarization, with a growing gap between a few high-performing firms and a growing number of low-performing firms. 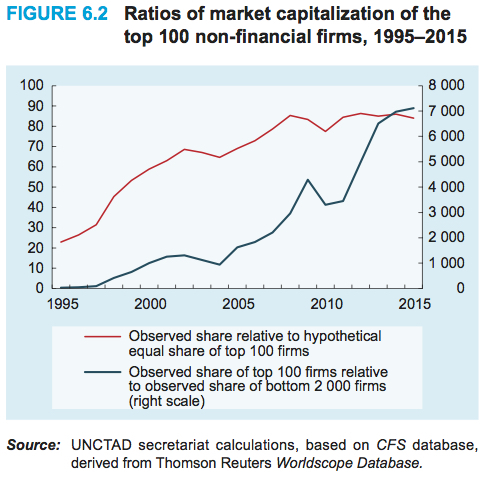 That conclusion is confirmed by their analysis of market concentration, which is presented in Figure 6.2 in terms of the market capitalization of the top 100 nonfinancial firms between 1995 and 2015. The red line shows the actual share of the top 100 firms relative to their hypothetical equal share, assuming that total market capitalization was distributed equally over all firms. The blue line shows the observed share of the top 100 firms relative to the observed share of the bottom 2,000 firms in the sample. So, what is causing this growth in market concentration? One reason is because of the nature of the underlying technologies, which involve costs of production that do not rise proportionally to the quantities produced. Instead, after initial high sunk costs (e.g., in the form of expenditures on research and development), the variable costs of producing additional units of output are negligible. ***** And then, of course, growing firms can use intellectual property rights and lobbying powers to protect themselves against actual or potential competitors. 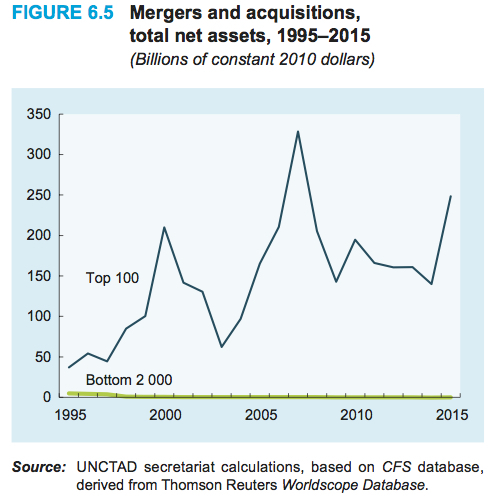 Giant firms can also use their super-profits to merge with and to acquire other firms, a process that has accelerated because—as both a consequence and cause—of the weakening of antitrust legislation and enforcement. The models of mainstream economics turn out to be a shield, hiding and protecting this strengthening of corporate rule. What the rest of us, including the folks at UNCTAD, have been witnessing in the real world is the emergence and consolidation of global rentier capitalism. *There’s another reason why the long run is so important for neoclassical economists. All incomes are presumed to be returns to “factors of production” (e.g., land, labor, and capital), equal to their “marginal products.” But short-run super-profits are a theoretical embarrassment. They represent a return not to any factor of production but to something else: serendipity or Fortuna. Oops! That’s another reason it’s important, within a neoclassical world, for short-run super-profits to be competed away in the long run—to eliminate the existence of returns to the decidedly non-productive factor of luck. 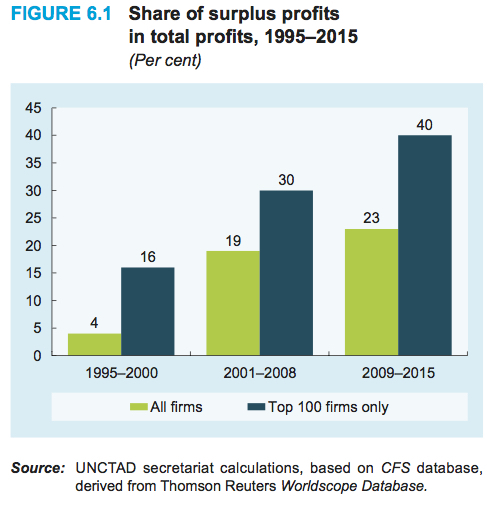 **UNCTAD defines surplus profits as the difference between the estimate of total typical profits and the total of actually observed profits of all firms in the sample in that year. Thus, they end up with a lower estimate of surplus or super-profits than if they’d used a strictly neoclassical definition, which would compare actual profits to a zero-rent (or long-run equilibrium) benchmark. these results need to be interpreted with caution. More important than the absolute size of surplus profits for firms in the database in any given sub-period, is their increase over time, in particular the surplus profits of the top 100 firms. 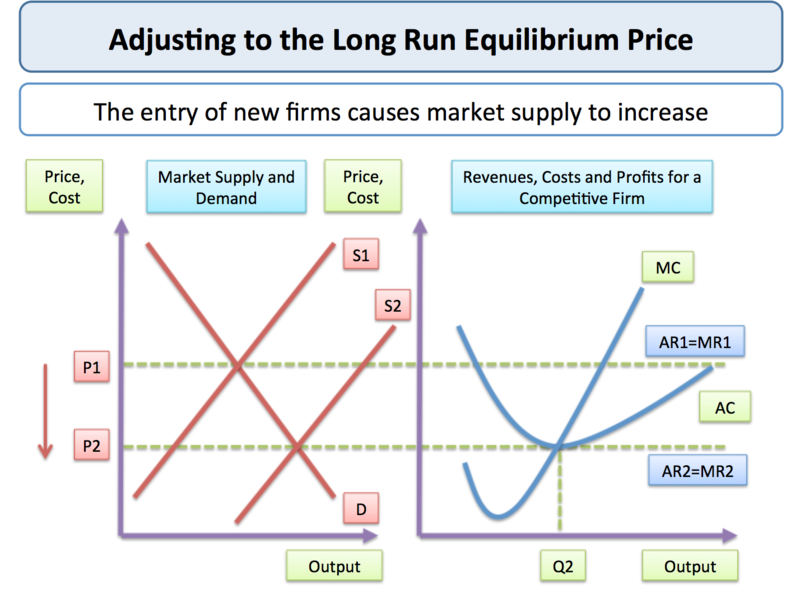 *****Thus, as Piero Sraffa argued long ago, the standard neoclassical model of perfect competition, with U-shaped marginal and average cost curves (i.e., “diminishing returns”), is called into question by increasing returns, with declining marginal and average cost curves. Sometimes we just have to sit back and laugh. Or, we would, if the consequences were not so serious. I’ve been reading and watching the presentations (and ensuing discussions) at the Rethinking Macroeconomic Policy conference recently organized by the Peterson Institute for International Economics. Quite a spectacle it appears to have been, with an opening paper by famous mainstream macroeconomists Olivier Blanchard and Larry Summers and a closing session—a “fireside chat” without the fire—with the very same doyens of the field. The basic question of the conference was: does contemporary macroeconomics, in the wake of the Second Great Depression, require a few reforms or does it need a wholesale revolution? Blanchard lined up in the reform camp, with Summers calling for a revolution—with the added spice of Adam Posen referring to himself as Trotsky to Summers’s Lenin. Most people would think it’s about time. They know that mainstream macroeconomics failed spectacularly in recent years: It wasn’t able to predict the onset of the crash of 2007-08. It didn’t even include the possibility of such a crash occurring. And it certainly hasn’t been a reliable guide to getting out of the crisis, the worst since the Great Depression of the 1930s. Only mainstream macroeconomists could possibly have thought that capitalism is self stabilizing. The rest of us—who have read Marx and Keynes as well as the work of Robert Clower, Hyman Minsky, and Axel Leijonhufvud—actually knew something about the roots of capitalist instability: the various ways a monetary commodity-producing economy might (but not necessarily) generate imbalances and instabilities based on the normal workings of the system. Yes, of course, temporary shocks can have permanent effects. How could they not, when tens of millions of people are thrown out of work and, especially in the wake of the most recent crash, inequality has soared to new heights? And then there are those “non linearities,” the idea that financial crises are characterized by feedback effects such that shocks, even small ones, “are strongly amplified rather than damped as they propagate.” Bank runs are the quintessential example—whether customers demanding their deposits in the first Great Depression or the run on financial institutions (including insurance companies that issued credit default swaps) that occurred in the midst of the second Great Depression. But that’s not all: when corporations, facing a declining profit rate, choose to sell but not purchase, they make individually rational decisions that can have large-scale social ramifications—for workers, indebted households, and other corporations (on both Main Street and Wall Street). So mainstream macroeconomists appear to be waking up from their slumber and seeing capitalism as it is—and as it has functioned for 150 years or so. You’d think, then, with all the rhetoric of reform and revolution, they’d be in favor of questioning the entire edifice of their theories and models. What we get instead is a bit of tinkering, along the lines of the following: (a) monetary policy is limited because of low interest-rates (although it’s still expected to provide generous liquidity in the even of another shock); (b) more active financial regulation, which still may not be able to keep up with the quickly changing and complex structure of the financial sector and actually prevent financial risks; thus (c) fiscal policy should once again be important, both because of the limits on monetary policy and financial regulation and because, with low interest-rates, government debt is less significant. There’s no reform being proposed here, let alone a revolution. It’s just business as usual, which is exactly the way the recovery itself has been treated. In the end, Blanchard, Summers, and the other participants in the conference are the macroeconomists who developed the current models and policies. Thus, for all they might venture some mild criticisms of the pre-crisis orthodoxy and call for some new ideas, they are so invested in the status quo, no one should expect a truly radical rethinking from them. To expect otherwise is just laughable. *Yes, there was one paper in the conference on inequality, by Jason Furman, but it was about growth, not macroeconomic policy. The theme of inequality was not taken up in the rest of the conference—and it was even ridiculed (e.g., in terms of the research currently being conducted in the IMF) by Summers in the final session. John Hatgioannides, Marika Karanassou, and Hector Sala are absolutely right: mainstream macroeconomists and policymakers never venture beyond the “holy trinity” of economic growth, inflation, and unemployment. * Everything else, including the distribution of income and wealth, is relegated to the fringes. This problem, while always serious, has been magnified in recent decades as inequality has grown to obscene levels, particularly in the United States. 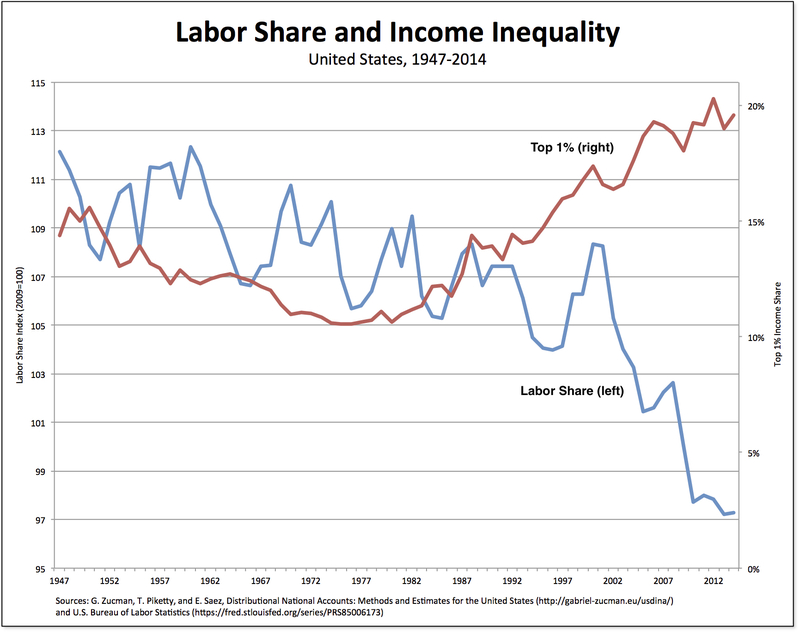 The labor share (the blue line in the chart above) has been falling since 1960 and, in the past decade and a half, it dropped an astounding 10.2 percent. Meanwhile, the share of income captured by the top 1 percent (the red line in the chart) has soared, rising from 10.5 percent in 1976 to 19.6 percent in 2014. They focus particular attention on inequality in relation to tax contributions. But they do so in the manner that departs from the usual discussion, which leaves the discussion at absolute income tax contributions (such as the share of income taxes paid by each economic group). Those are the numbers we often hear or read, which seek to show how progressive the U.S. tax system is. For example, according to the Tax Foundation, the top 1 percent paid a greater share of individual income taxes (39.5 percent) than the bottom 90 percent combined (29.1 percent). Instead, Hatgioannides, Karanassou, and Sala concentrate on the ratio of the average income tax per given income group divided by the percentage of national income captured by the same income group (what they call the Effective Income Tax contribution), whence they calculate an inequality index (the Fiscal Inequality Coefficient). What the Fiscal Inequality Coefficient shows is the relative contribution of filling the fiscal coffers for different pairs of income groups. 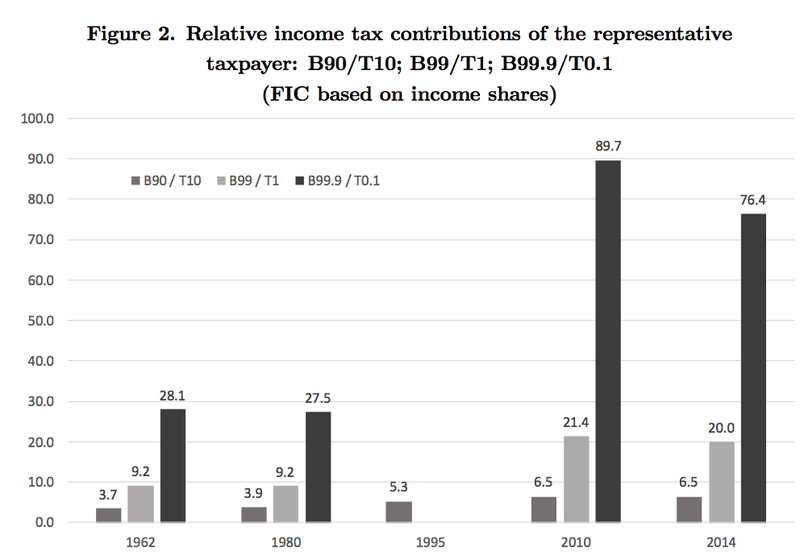 In the figure above, they plot the Fiscal Inequality Coefficient based on income shares (they also report a related index based on wealth), of the bottom 90 percent versus the top 10 percent, the bottom 99 percent versus the top 1 percent, and the bottom 99.9 percent versus the top 0.1 percent for 1962, 1980, 1995, 2010, and 2014. Clearly, the relative income tax burden for those at the top has fallen over time, demonstrating that the U.S. tax system has become less, not more, progressive. In the current era of fiscal consolidation should the rich be taxed more? Our evidence suggests unequivocally yes. *Their paper is discussed in the Guardian by Larry Elliott. The submitted version of their article is available here. **The results are even more dramatic if one calculates the Fiscal Inequality Coefficient based on household wealth shares: in 2010, the Bottom 99.9 percent contributed 208.9 times more than the Top 0.1 percent, nearly four times more than what it was in 1980!